It's been halting, but signs of spring are popping up around our home and yard. Of course, I had to make a new banner for my wreath, and a matching one for the mantle. I also decided I needed something extra for the couch. I made a this fun pillow cover, inspired by Corey's pillow. I used my finished edge for the circles. I was excited to discover the previous home owner planted some bulbs in the front yard! I wanted to bring a little of the feeling of outdoors in. So with some of the left over crepe paper from our rainbows and my hot glue gun, I added some little flowers to the branches in my vase (also on the mantle). Hoping this weekend is filled with the promise of spring where you live. Tatertots and Jello, and Today's Creative Blog. oooh, very pretty! i especially love the yellow crepe paper flowers! It does look like spring! We're having snow today. I hope spring shows up to stay soon. I love your wreath, it always SO cute! the tree branches are so light and airy! spring is here, yay! The wreath is so sweet! Here nobody hangs wreaths on their door except for christmas time. I wish it didn't look weird if I made one for my door! The circle pillow is so original. I love it! Loving spring's promise at your home. 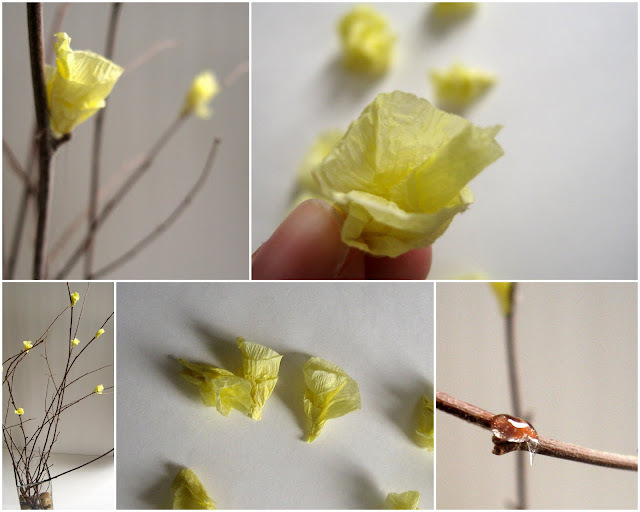 The yellow tissue paper on your branches is perfect. I think I love yellow most in the spring. Sometimes it is the little things. The branches look like forsythia and they really light up that space. so sweet and beautiful. the ideas and banner are great. I love your new pillow! It's adorable. And I love the flowers you added to the branch. It looks fantastic on the mantle. Preciousness! I think all of this is so sweet! Love your wreath! It is beautifully simple!